The VWR Sanyo Undercounter Lab Refrigerator SR-L4110W is built for everyday laboratory use and simple refrigerated storage of non-critical samples and consumables. This 4.9 cu ft lab refrigerator is convenient to keep nearby work areas for fast access to necessities, either on top or tucked under a lab bench. This lab fridge features an adjustable mechanical thermostat with a temperature range between 1-10°C, and maintains 4°C easily. The exterior of this undercounter lab refrigerator is a corrosion resistant, with an easy to clean interior, flat solid door, and adjustable full depth shelving to capitalize every inch of chamber space. The VWR Sanyo SR-L4110W is an economical solution for when alarms are unnecessary and precise temperature control and stability aren’t a critical need. 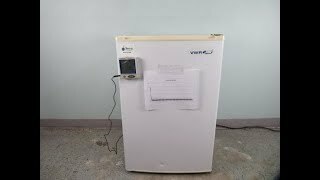 This VWR Sanyo Undercounter Lab Refrigerator SR-L4110W has been fully inspected and comes with current temperature validations. All of our lab equipment comes backed with our standard warranty. Should you have any questions about this or any of our other lab refrigerators, please don't hesitate to contact us.